The concept that individuals with the same disease and a similar clinical presentation may have very different outcomes and need very different therapies is not novel. With the development of many innovative tools derived from the omics technologies, transplant medicine is slowly entering the era of precision medicine. Biomarkers are the cornerstone of precision medicine, which aims to integrate biomarkers with traditional clinical information and tailor medical care to achieve the best outcome for an individual patient. Here, we discuss the basic concepts of precision medicine and biomarkers, with a specific focus on progress in renal transplantation. We delineate the different types of biomarkers and provide a general assessment of the current applications and shortcomings of previously proposed biomarkers. We also outline the potential of precision medicine in transplantation. 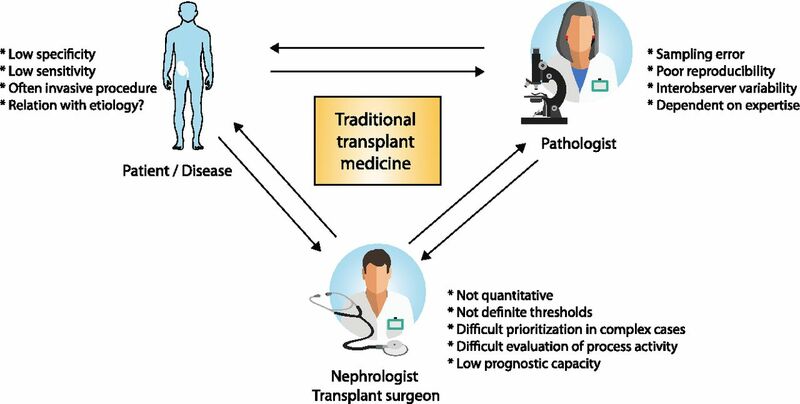 Moving toward precision medicine in the field of transplantation will require transplant physicians to embrace the increased complexity and expanded decision algorithms and therapeutic options that are associated with improved disease nosology. Several millennia ago, Hippocrates had the notion that individuals with a similar clinical presentation of a disease may have very different outcomes and require very different therapies: “It is far more important to know what sort of person the disease has, than what sort of disease the person has.” This makes him the father of precision medicine and illustrates that the quest for precision medicine is of all times. Biomarkers are the cornerstone of precision medicine, which aims to integrate molecular data (biomarkers) with traditional clinical information to tailor medical care to achieve an individual patient’s best outcome. Although precision medicine is rather proactive, traditional medicine is more reactive (predict and prevent instead of diagnose and treat). The applications of biomarkers in precision medicine range from evaluating an individual’s disease risk, detecting disease at an early stage, and diagnosing and evaluating a disease’s activity to estimating prognosis, predicting therapy responses or side effects, and guiding drug dosing. Also, the field of transplantation is slowly entering the era of precision medicine. In this review, we discuss the basic concepts of precision medicine and biomarkers, with a specific focus on progress in renal transplantation. The current clinical routine in kidney transplantation uses an age-old toolbox of markers that primarily include serum creatinine/eGFR, proteinuria, and graft histology, with the more recent adjunction of donor-specific antibody (DSA) monitoring. Despite the clinical usefulness of these markers in clinical transplantation, all of these markers have inherent problems, most importantly low sensitivity and specificity, invasiveness, and clinical problems for interpretation1–4 (Figure 1). The shortcomings of currently used biomarkers in transplant medicine. To overcome the shortcomings of traditional transplant medicine, many candidate biomarkers have been proposed and tested in recent years as summarized extensively in several review articles,5–10 most recently by ourselves (Table 1).11 Rigorous evaluation of novel biomarkers requires a multistep approach that includes a discovery phase followed by various internal and very importantly, external validation methods, taking into account the prevalence of the disease in a real life setting as we outlined in detail in our recent publication.11 In addition, multiple testing should also be taken into account to avoid type 1 error or inflated C statistics. The characteristics and performance of these individual markers are beyond the scope of this review. Here, we provide a general assessment of the current applications and shortcomings of previously proposed biomarkers and an outline of the potential of precision medicine in transplantation. It is very important to discriminate between the different applications of biomarkers, which can be used for risk assessment, noninvasive screening and diagnostics, invasive disease confirmation, and prognostic or predictive purposes as outlined in Figures 2 and 3. 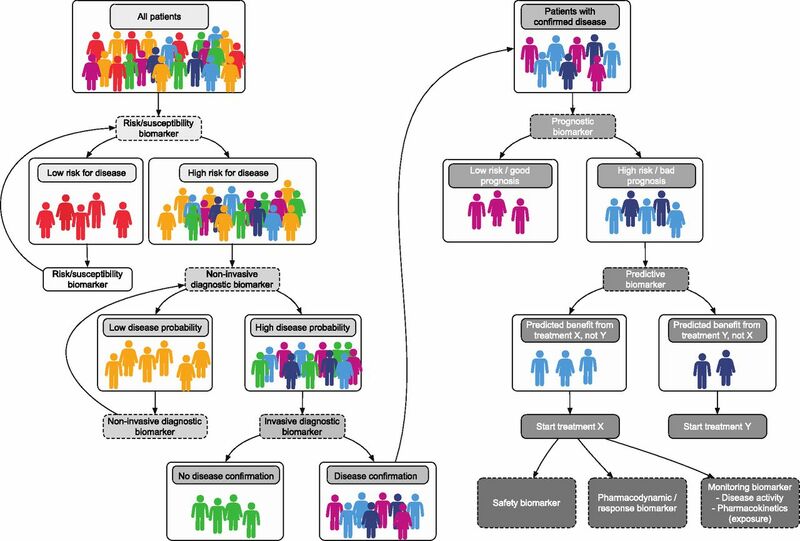 Overview of biomarker subtypes for precision transplant medicine. 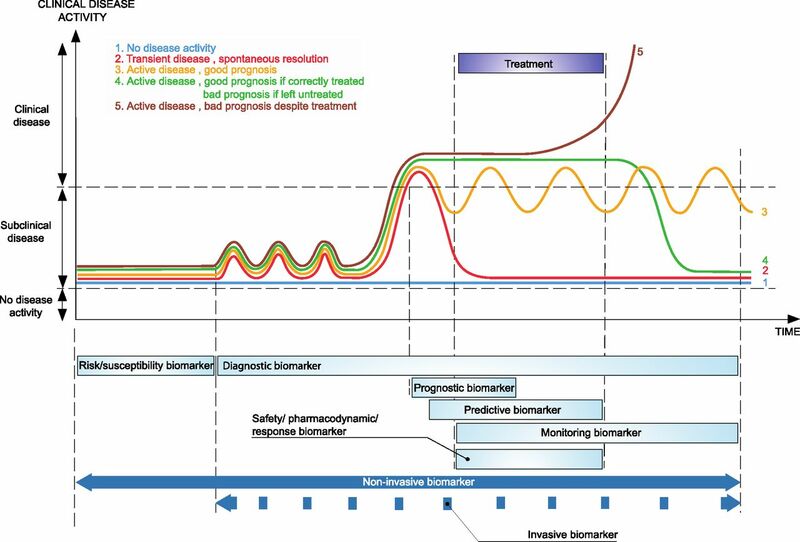 Time dependency of the different types of biomarkers for precision medicine. Before any disease activity is present, risk/susceptibility biomarkers will facilitate the identification of high-risk patients who require closer follow-up examinations, which are typically performed using noninvasive diagnostic biomarkers. These biomarkers ideally also detect subclinical disease activity before clinical signs or irreversible injury become evident. After a disease process is diagnosed or its activity is assessed, a prognostic biomarker estimates the effect of the disease and the chance of spontaneous resolution versus that of irreversible injury and eventually, graft failure. A prognostic biomarker should be able to identify those patients who need treatment and those patients who will have spontaneous disease resolution or a good prognosis in the absence of therapy. If a patient with disease would have a poor outcome according to the prognostic biomarker, the search for an appropriate therapy can begin. Ideally, this therapy is not solely on the basis of the diagnosis and prognosis of the disease but also, on the basis of predictive biomarkers that predict which treatment has the highest chance of success in reversing the outcome. Disease activity should be assessed over time using monitoring biomarkers, including after therapy cessation. In addition, there are crucial differences in the nature of biomarkers. If repeated biomarker assessment is necessary (e.g., as with diagnostic biomarkers for subclinical disease, safety/pharmacodynamic/response biomarkers, and monitoring biomarkers), ideally, noninvasive tests should be developed and used. For biomarkers that are used for treatment decisions (e.g., whether to start treatment and the type of treatment), such as some diagnostic, prognostic, and predictive biomarkers, noninvasiveness is a plus but is not essential. Important treatment decisions are typically not very repetitive and can be on the basis of invasive biomarker assessments. Thus, invasive biomarkers have very different clinical applications than noninvasive biomarkers. In the field of transplantation, there has long been great interest in defining patients at increased risk of acute rejection or graft failure among other conditions. Typically, this risk is evaluated using not only some demographic determinants (e.g., donor/recipient age, ethnicity, socioeconomic background) but also, widely used markers, such as donor-recipient HLA mismatch and the presence or de novo occurrence of HLA DSAs.12 Despite the great importance of a correct risk assessment, the definition of the high-risk subpopulation in renal transplantation is not well standardized. A more thorough evaluation of the donor-recipient HLA mismatch (e.g., using epitope mismatch analysis) may provide a more precise immunologic risk assessment. The tools are already available (e.g., HLAMatchmaker and EpViX),13,14 and several small studies suggest that epitope mismatch analysis is capable of identifying high-risk donor-recipient pairs.15–19 However, apart from the evaluation of acceptable mismatches in extremely sensitized patients (e.g., in the Eurotransplant region with the “Acceptable Mismatch” program), epitope mismatching has not yet been translated into a clinical strategy for the overall transplant population, and the potential benefits in risk prediction for T cell–mediated rejection (TCMR) and the occurrence of de novo DSAs remain unexplored. Additional risk/susceptibility biomarkers that are currently used in clinical practice are derived from increasing insight into the pathophysiology of primary renal diseases. Recent advances in the understanding of the pathogenesis of atypical hemolytic uremic syndrome permit an individualized risk assessment of post-transplant disease recurrence on the basis of the mutations involved in alternative complement pathway dysregulation.20 The impressively improved risk assessment of patients with atypical hemolytic uremic syndrome is truly precision medicine; this application not only uses genetic risk/susceptibility biomarkers but also, illustrates that this strategy can be adopted rapidly in routine clinical practice if the results and outcome improvements are compelling. In precision medicine, which tries to be proactive and preventative, repeated assessment of the probability (screening) of ongoing subclinical injury is necessary, especially in higher-risk populations (Figures 2 and 3). The repeated character necessitates noninvasiveness to avoid complications of the screening procedure in itself. As is illustrated in Table 1, many research teams have worked on diagnostic biomarkers for kidney transplant injury, primarily acute rejection. Our recent overview11 discussed the many studies in this domain in great detail. Figure 4 provides a visual overview of the summary table that was provided in this publication. Overview of the diagnostic performance (sensitivity and specificity) of the noninvasive diagnostic biomarkers for acute rejection. Modified from ref. 11, with permission. The vast majority of studies on diagnostic biomarkers focused on single noninvasive blood or urinary molecules for diagnosing ongoing acute rejection. Several molecules were repeatedly assessed as candidate biomarkers, such as urinary CXCL10, perforin, granzyme B and granulysin mRNA, urinary CXCL9 and CXCL10 protein, and blood granzyme B and perforin mRNA. The potential of miRNA molecules in urine and peripheral blood samples for diagnosing acute rejection or allograft dysfunction has been also evaluated.11 The summary of this research, depicted in Figure 4, illustrates that the results of these studies are not consistent. There is much heterogeneity in the diagnostic performance of these biomarkers, which can be partially explained by the low numbers included in these studies and the different phenotypes of the study populations. The intrinsic difficulties in urinary sampling are potentially less present in peripheral blood sampling. Several studies evaluated the diagnostic performance of granzyme B, perforin, and a few other molecules in single-center studies (Figure 4). Overall, the diagnostic performance remains very inconsistent across these studies, which is likely related to the small cohort sizes and perhaps, the inherent insufficient robustness of the hypothesis-driven markers.11 Overall, the clinical diagnostic value of single biomarkers remains unclear, and large multicenter studies are still needed. More recent attempts to establish blood-based multigene diagnostic biomarkers for acute rejection could perhaps become more successful. Two groups32,33 recently developed interesting but insufficiently validated peripheral blood gene expression tests (the TruGraf and kSORT tests, respectively; details are in our recent overview11). These tests are now being developed commercially, although further validation in prospectively collected and unselected samples is warranted for the further development of these diagnostic biomarkers. A major issue regarding the recently proposed noninvasive markers for acute rejection is the fact that these markers are essentially developed for the kidney transplant population as a whole. The low risk of acute rejection automatically leads to low PPVs and high NPVs.5,11 A better development strategy could be to restrict the use and validation of these noninvasive diagnostic biomarkers to the subgroup of patients at a higher immunologic risk (e.g., patients with DSAs). This is the patient population with the highest medical need and most likely to benefit from improved monitoring and early diagnosis, primarily of antibody-mediated rejection. Studying candidate biomarkers in higher-risk individuals will automatically increase the PPVs to desirably higher levels. A high NPV is useful in clinical practice to rule out disease activity but not if the chance of the disease is intrinsically very low. The development of noninvasive diagnostics should, therefore, go along with the establishment of advanced risk assessment as outlined above. This brings us to another drawback of the currently used noninvasive diagnostic biomarkers for rejection. None of these biomarkers were developed specifically for ABMR, and most studies did not even make a distinction between TCMR and ABMR. The number of patients with ABMR is likely very low in these studies, which calls into question the validity of the markers for this highly relevant injury process. The development of biomarkers for patients at high risk of ABMR using molecules able to diagnose subclinical and active ABMR is urgently needed to improve patient outcomes. In the precision medicine scheme (Figure 2), invasive diagnostics are often necessary to confirm the diagnosis in patients with cases in which noninvasive diagnostics show a high probability of active disease. Also, when there are no sensitive noninvasive markers (e.g., in kidney transplantation), invasive biomarkers are necessary to detect subclinical disease (e.g., protocol biopsies). In addition, invasive diagnostics help in refining the exact diagnosis (e.g., discriminating TCMR from ABMR), which is often not possible with the noninvasive markers. The Banff consensus on renal transplant pathology typically discusses the invasive diagnostic criteria of transplant pathology and includes sufficiently validated markers in updates of the Banff classification, including molecular diagnostics.34,35 Until today, the evolving Banff consensus was mainly reached through clinicopathologic studies describing the association between histologic features and clinical outcomes. Since the conception of the Banff system >20 years ago in 1993, very few histologic markers have been added to the Banff scheme. Clearly, this strategy has been very successful in describing the phenotype of antibody-mediated rejection in the past decade, but other more common inflammatory processes (tubulitis, interstitial inflammation, inflammation in areas of atrophy, etc.) remain ill defined. The complexity of the scheme for antibody-mediated rejection illustrates that the Banff classification is reaching its limits, and important further progress cannot be expected from this very descriptive approach of linking histologic changes to clinical end points. The associations of histologic and intrarenal mRNA expression changes with transplant outcomes have been extensively studied to improve the classification of transplant injuries.36,37 This research led to the suggestion that intrarenal mRNA markers of endothelial activation could also be used as diagnostic criteria in the Banff classification for ABMR,38 although it is acknowledged that these diagnostic biomarkers require additional validation before being clinically used.34,35 The potential application of intrarenal mRNA expression analysis for the diagnosis of endothelial activation or other markers of ongoing disease activity is currently limited to a small number of centers, but it is likely to become more important as the molecular analysis of biopsy tissue becomes more technically and economically feasible. The approach to enrich histologic diagnoses with molecular data (“molecular microscope”) has several benefits, including increased reproducibility, probabilistic data, and fewer problems with sampling error and tissue heterogeneity.36,37 However, extensive validation studies are necessary to show that the molecular biomarker approach is better for diagnostics than the current gold standard histologic assessments performed by expert pathologists. The clinical usefulness of this approach will be shown when molecular diagnosis improves the diagnostic accuracy, with expert histologic classification as the gold standard (in comparison with local, nonexpert pathology), or when molecular diagnosis improves the (prediction of) patient outcomes. This topic relates to a crucial characteristic of disease reclassification: reclassification should translate into either a more accurate assessment of outcomes (better prognostic capacity) or a better assessment of treatment opportunities (better predictive capacity). The introduction of new disease classifiers in the Banff classification (C4d deposition, DSA presence, and peritubular capillaritis score) was preceded by studies illustrating that these parameters were independently associated with outcome. The association of a marker with outcome could make it a useful diagnostic addition; however, the significant association of a marker with outcome does not automatically make it a useful prognostic biomarker, which we outline below. Prognostic Biomarkers: Treat or Do Not Treat? Currently used prognostic biomarkers in kidney transplantation are serum creatinine/eGFR, proteinuria, DSA, and of course, graft histology with the updated Banff classification. Each of these markers is associated with graft outcome and currently used in routine clinical practice for not only diagnosis but also, decisions on which patients need treatment for, for example, rejection or recurrent glomerular disease. As discussed above, the current Banff classification integrates prognostic aspects in the diagnostic framework and is, therefore, partly prognostic. This is clearly the case for ABMR, but other diagnoses (like TCMR) lack this prognostic capacity and need attention in future updates of the Banff consensus. Multidimensional clinicopathologic prognostic algorithms (integrating histologic lesions with graft functional parameters and antibody status) could be constructed and become useful for clinical decision making, but they are currently not available. Previous efforts at developing prognostic systems on the basis of combinations of functional and histologic parameters have been hampered by small sample sizes, absence of proper validation, and limited phenotypic detail. The complement binding capacity of DSA, determined using C1q or C3d flow bead assays, has recently been suggested as a prognostic biomarker. In patients with DSA, a positive test identified those patients at an increased risk of graft failure with moderate accuracy, whereas patients with a negative test did not have this increased risk.39–41 The discussion of whether the complement binding characteristics are relevant independent of the mean fluorescence index is not yet closed, and it remains unclear whether the test improves prognostic accuracy in patients who are actually diagnosed with ABMR. Further evaluation of this potential is necessary before the complement binding capacity of DSA could become a clinically accessible prognostic biomarker. Several other prognostic markers have been proposed. A few years ago, Einecke et al.42 described a biopsy-based “molecular classifier” for graft failure at the time of graft dysfunction (i.e., at the time of a for-cause biopsy). The test was not further validated or developed as a biomarker, and it remains unclear how the test relates to the histologic diagnosis of a biopsy, complicating the assessment of its clinical utility as a prognostic marker in conjunction with standard routine markers and histologic data. Few studies have evaluated prognostic tools for patients who have already received a specific diagnosis, such as ABMR. The team in Edmonton built a biopsy mRNA-based “ABMR molecular score” that improved the stratification of patients at high risk for graft loss both in addition to and compared with conventional (histologic) assessments in patients with kidney transplants and ABMR.45,46 Although the significant improvement in stratification that seems to be offered by this test is promising, the actual prognostic performance of this test (PPV and NPV for graft failure in patients diagnosed with ABMR) has not yet been evaluated. Extensive further validation and assessment of the potential clinical usefulness of the ABMR molecular score are necessary. Finally, it is remarkable that, for most other potentially reversible transplant pathologies, such as TCMR, polyomavirus nephropathy, and de novo or recurrent glomerulopathy, no prognostic tools have been proposed to decide which patients could benefit from specific treatment. Predictive Biomarkers = Which Treatment? The difference between a prognostic biomarker and a predictive biomarker could, at first, seem to be a semantic difference, but it is not (Figures 2 and 3). A prognostic biomarker identifies the likelihood of a clinical event, such as disease recurrence or progression (e.g., the likelihood of graft failure). A predictive biomarker is used to identify individuals who are more likely than similar patients without the biomarker to experience a favorable or unfavorable effect from a specific intervention or exposure. A predictive biomarker facilitates decisions regarding which therapeutic intervention would help improve the outcome of a disease. However, for renal allograft pathologies, no predictive biomarkers are available to facilitate treatment decisions. After the diagnosis of, for example, ABMR, TCMR, or PVAN is made, treatment decisions are on the basis of the diagnosis and prognosis but not on the basis of predictive tests. A predictive marker that could guide therapeutic decisions would be very useful in diseases where there is substantial heterogeneity in the responses to treatment, such as is the case in allograft rejection. Predictive markers that have recently been suggested in kidney transplantation but that lack supportive data are the complement binding capacity of DSA or C4d deposition in peritubular capillaries as a marker of complement activation for facilitating decisions regarding the use of complement inhibitors to treat ABMR. Monitoring Biomarkers: Treatment Success or Failure? Monitoring biomarkers are serially measured and used to detect a change in the degree or extent of disease after a diagnosis is made. Monitoring markers can provide information on when to stop treatment, whether to continue treatment, and when treatment is no longer efficacious. The frequent serial measurement of monitoring markers is only feasible if these markers are noninvasive. Monitoring biomarkers that are currently used in clinical kidney transplantation are serum creatinine/eGFR, proteinuria, hematuria, signs of intravascular hemolysis, and BKV viral load. The problem with using these markers for monitoring is their nonspecificity for renal pathology and their poor sensitivity for subclinical ongoing disease; thus, they are intrinsically insufficient for assessing disease activity. To date, no specific and sensitive disease activity monitoring markers have been developed for use in kidney transplantation. Potential markers, such as the blood-based diagnostic biomarkers kSORT and TruGraf or urinary profiling (see above),31–33 require much more work in terms of studying their kinetics over time, including during and after treatment, before they can be proposed as monitoring markers. Pharmacodynamic/Response Biomarkers and Safety Biomarkers: What Dose? In transplantation, because of the narrow therapeutic index of most immunosuppressive agents and because of the nephrotoxicity of, for example, calcineurin inhibitors, these markers are widely used and comprise peripheral blood drug-level monitoring, peripheral blood cell counts, liver function tests, and follow-up tests for glycemia, BP, cholesterol level, and kidney function. The development of biomarkers and precision medicine remains a vast task, and transplant physicians are now facing an increasing number of new, innovative tools entering the market. Surprisingly, very few of them have been or will be truly implemented in the clinic. Our view is that the lack of validation (the discovery step often inflates predictive values) and the lack of demonstrations of improved clinical outcomes for individual patients are the main driving forces for the lack of adoption by physicians and/or funders. Figure 5 illustrates the complexity of and the ideal pipeline for developing clinically usable and useful biomarkers in renal transplantation. Ideal pipeline for developing clinically usable and useful biomarkers in renal transplantation. The clinical assessment of medical devices is on the basis of completely different methods from those applied to medicinal products; consequently, new tools might be marketed after a very limited validation process, which may alter the capacity of the medical device to be reimbursed by National Health Insurance, with reimbursement being guided on the basis of assessments of the actual benefit and the added clinical value. Therefore, a strong multistep validation is required to avoid concerns that new diagnostic tests may increase health care expenditures and skepticism about their benefits in terms of improving clinical management. Increasing the complexity of transplant medicine may also limit the enthusiasm of transplant physicians for using innovative biomarkers. Nevertheless, because we need to move toward precision medicine in the field of kidney transplantation, we are to embrace the increased complexity and the expanded decision algorithms and therapeutic options that are associated with improved disease nosology. M.N. is supported by grants TBM-150199 and 130758 from The Research Foundation, Flanders and grant IWT-130758 from Flanders Innovation and Entrepreneurship (Agentschap Innoveren en Ondernemen) of the Flemish Government. D.A. is supported by the Emmanuel Boussard Foundation and the Day Solvay Foundation. This work is part of the BIOMARGIN (BIOMArkers of Renal Graft INjuries) European Research Network (Collaborative Project) supported by European Commission grant 305499 under the Health Cooperation Work Programme of the Seventh Framework Programme. M.N. and D.A. contributed equally to this work.